Porcelain. 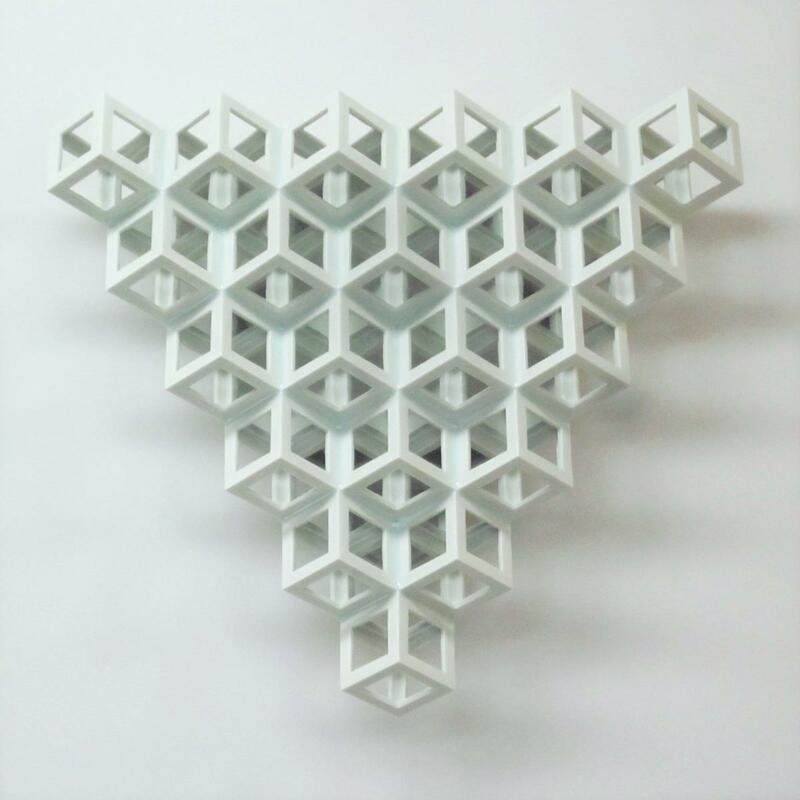 “Lattice receptacle” series is a work of art made out of porcelain lattice structure as a fundamental form. Its creation is constructed by the accumulation of the base unit (cubic hollow) that is formed regularly by slip casting technique. For his expression in ceramics, the form and the internal space are most important themes. “Every void plays a role as a receptacle, and they may find meaning of existence by having themselves fulfilled somehow. It is the same principle underlies the void “on a plate” and the void “in space”. I believe that a further development in representing ceramic art holds a potential to satisfy people’s open senses, and invites us to the infinite experiences.” The production method of unit accumulation derives geometric and formative aesthetics that also creates the capacity of space and density. The internal space that is opened by lattice structure becomes a device to receive lights, and together with permeability of porcelain it emphasizes the aspects of lights and shadows. Born in 1974 in the Kagawa Prefecture, Japan, and completed Ph.D. studies in Ceramics at the Kyoto City University of Arts, in 2006. His works are exhibited in public collections at several international museums and institution such as the Bank of Kyoto, Yngge Ceramics Museum Taipei, Faenza International Museum of Ceramics or Icheo World Ceramic Center, in South Korea. In 2001, Kamei became the second youngest person ever to win the Grand Prize at the prestigious Asahi Ceramics Fair. His work was chosen both for his totally original architectural concept and for the technical achievement of joining complex porcelain bodies. Lattice Receptacle Series: “Lattice receptacle” series is a work of art made out of porcelain lattice structure as a fundamental form. Its creation is constructed by the accumulation of the base unit (cubic hollow) that is formed regularly by slip casting technique. For his expression in ceramics, the form and the internal space are most important themes. “Every void plays a role as a receptacle, and they may find meaning of existence by having themselves fulfilled somehow. It is the same principle underlies the void “on a plate” and the void “in space”. I believe that a further development in representing ceramic art holds a potential to satisfy people’s open senses, and invites us to the infinite experiences.” The production method of unit accumulation derives geometric and formative aesthetics that also creates the capacity of space and density. The internal space that is opened by lattice structure becomes a device to receive lights, and together with permeability of porcelain it emphasizes the aspects of lights and shadows.